Most BayBuzz readers probably take for granted quality broadband access to the Internet. Indeed, as we report below, fully 98% of our readers enjoy such access. But internet access is not universally a reality, and even less a reality is true digital literacy. Hence an array of ‘helpers’, from Need a Nerd to SeniorNet. On 1 July 2010, Finland,that most super-chic of nations, giving the world such innovations as the wind turbine, ice skates, saunas, bubble chairs and Fiskars scissors (the ones with the bright orange handles) became the first nation to declare individuals’ access to the Internet a human right. And more to the technology point of this piece, Finland has also given the world the free Linux operating system, the first web browser (Erwise), the first text chat protocol (Internet Relay Chat, IRC) and, of course, Nokia mobile phones. And judging from that record of internet innovation, probably some of the world’s best hackers! On that July date, by law every Finn had to be provided broadband internet access at a minimum speed of 1Mb per second … with the standard set at 100Mbps in 2015. Five other countries – not exactly a digital tsunami – have adopted similar requirements. A somewhat surprising list – Costa Rica, France, Spain, Greece and Estonia. Its legal aspiration aside, Finland does rank 6th in the world in terms of internet speed, with an average of 20.5 Mbps and a robust 91% of citizens enjoying speeds of 4 Mbps or higher. By comparison, the download test I just conducted on my rural home computer (using a wireless service) delivered 15.21 Mbps. Depending on whom you believe, the average NZ speed is about 16.6 Mbps, placing us 30th in the world (the global average is 7.2 Mbps. But I digress, the focus of this piece is not speed, but rather digital literacy … specifically workable access by a segment of our population that lags in online savvy, senior citizens. Our recent BayBuzz Reader Survey got me on to this topic. 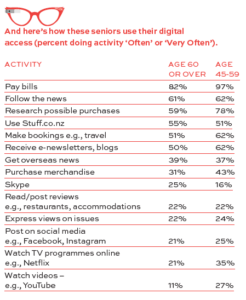 We asked a few questions about online access and usage, and were impressed with how ‘wired’ (actually, for many ‘wireless’) our readers are, especially since a key chunk of our readership is age 60-plus (64%). 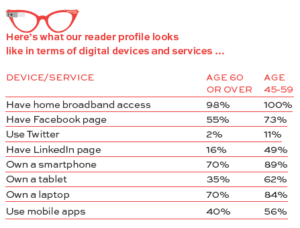 Offsetting their age, which in the general population is associated with lower use of online tools and services, many of our ‘senior’ readers are quite well-educated (58% hold a bachelor’s or post-graduate degree), which is generally associated with higher online/mobile usage. When it comes to keeping abreast of the news digitally, our seniors are very bit as connected as our younger readership. Our seniors tend to go online less for transactions – bill paying, purchases and bookings, and they are much less into online video … except Skype, which I presume is all about keeping track of the rellies. To test our BayBuzz profile against the real world of digital usage and prowess in our senior citizen community, I visited with Terry Mortensen, chairman of Havelock North’s SeniorNet. SeniorNet has been in Havelock North for 22 years, and leases space at the Mary Doyle Lifecare Centre. The community organisation has about 300 members who pay a $20 per year membership, giving them access to a full range of digital training programmes at the centre, as well as individual in-home tutorials. A volunteer staff of about eight tutors and thirty helpers provide the training, which could range from mastering iPads to producing online photobooks to using mobile apps or social media to researching genealogies. One-on-one tutoring costs $10/hour, while group sessions delivered at the centre are $5/hour and typically might involve two 2-hour sessions over two weeks … broader topics might require five weeks of sessions. About 50-60 members are involved in training in an average month. Terry observes that those participating in SeniorNet are largely driven by the desire to connect with distant family members … “most important on our members’ wish list,” he says. And although they are active web browsers, they are not as comfortable with online banking (“our members have a lot of mistrust”) or purchasing. He notes that the government agencies are also a major force in pressing citizens – like it or not – to access information and services online. Terry volunteers 25-30 hours per week at SeniorNet. Asked why he made such a substantial commitment, he commented on the “pleasure I get from those ‘A-ha’ moments” when someone masters a device or app – like taking photos with a cellphone or Skyping – that will help or enrich their daily lives. Terry also notes high interest these days in mastering mobile devices – smartphones and tablets – as these increasingly penetrate the senior market and facilitate family connection. See the adjoining chart for some mobile apps recommended for seniors by various sources. Keep your mind sharp with some of the best mind games around; designed by neuroscientists to enhance memory and attention. Do we need to describe the most popular way on the planet to connect with family and friends? Connect your social media accounts and the news and content sites that most interest you, and this app delivers your own customized digital magazine. Sick of forgetting or having to reset your password every time you log in to your bank, Facebook, Trade Me or PayPal? With this app, you only need to remember one password, which in turn gives you secure access to all your other passwords. Not itself an app, but a huge library of health-related apps developed with the Ministry of Health. If you can’t find it here, it doesn’t exist. Seniors do a heap of traveling. Keep all of your travel plans in one spot on your device and online. Travelling low budget? This app gives you the best info on over 1500 campsites around NZ. Seniors are collectors. Lets you create simple, easy-to-share, visual catalogues of things on the web that you like. Blows up the navigation and keypad buttons on your devices. Why just talk to your rellies when you can see them ‘live and in person’ … for free?! Pick your location and get a torrent of weather info. Seniors soak up the news. And no app delivers it more authoritatively. We couldn’t resist! Turns your iPad into a virtual piano which plays meow sounds to coax kitty from under the couch. SeniorNet is not the only way for area seniors to get help navigating the digital world. The Positively Aging Trust also operates a computer literacy programme called Digital Seniors, teaching basic skills in a six-week curriculum in most-used functions like email, Word documents, and Skype. 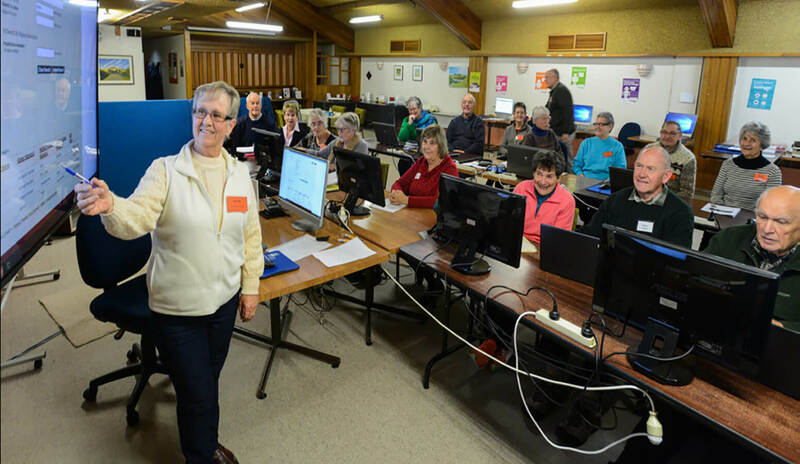 The programme delivers one-on-one tutoring at Heretaunga Seniors Hastings ($8/ week), Age Concern Waipukurau ($3/ week), Taradale RSA, Porangahau and Age Concern Wairoa (no charge at the last three locations). Perhaps such organisations are dinosaurs on the verge of extinction – Terry commented that the group had about 45% churn from year to year. Today’s most senior population will be replaced by Boomers, whose oldest members even were exposed to personal computers and the Internet during their working lives. And following the Boomers are generations that were born digital! On the other hand, most likely there will always be cries for digital help, as when (as happened to me a few days ago) all of a sudden one’s email crashes or a new device or app or software upgrade proves too challenging. As Terry notes: “The technology is always changing.” Digital ‘senior moments’ are unlikely to disappear! Both SeniorNet and Digital Seniors welcome enquiries from interested seniors.